Another cause worth your time and if we can get adventure bikers involved it'll be a really good feather in the cap for the biking community! 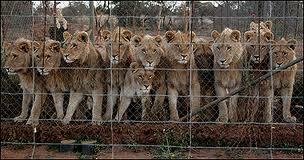 "We will call on our governments to BAN the deplorable Canned Hunting Industry. We will raise awareness to educate the rest of the world regarding every stage of the life-cycle of torture of a canned lion. The world needs to know - stop supporting the cub-petting & walk with lions experience – the first steps of untold misery for cubs ripped away from their mothers soon after birth. The fraudulent luring of ignorant volunteers who pay for the “privilege” to “care for” the cubs – all destined to be killed in an enclosed camp where they will have no way of escape. Often shot numerous times to prevent "spoiling" the trophy with a shot in the head, which will be mounted on a foreign wall and the bones exported to Asia for bogus medicine - all for top dollar. Join us and help us expose this crime – a crime against the very essence of morality. A crime against nature, a crime against Africa, a crime against humanity! Please join us, and if you can arrange a march in your city/town, please let us know. We want our message to be spread in, and to every corner of the world – however remote. It matters not how big or small your march – join us – save our lions! We will support of the work of Chris Mercer and Bev Prevan – for more information about their work - cannedlion.org"
Hoedspruit - *event page soon!